As a brand new boutique owner, it can be difficult to stand out from the crowd. After all, there are over 30 million small businesses present on Facebook alone, which is why it’s become so important to have a strong brand. Your visual identity as a start-up is everything, from your name to your logo and messaging. Your logo, in particular, is how you communicate with your consumer and build brand recognition; therefore, it’s imperative that it’s both unique and compelling. Why? Well, according to Action Card, it takes consumers only 10 seconds to develop a first impression of your brand’s logo. Moreover, according to Pam Marketing Nut, it takes consumers only 5-7 seconds to recognize a logo. 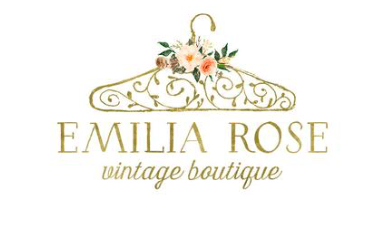 Struggling to design the logo for your clothing boutique? Worry not — I’ve got you covered. Designing your logo right so you can make the best first impression with your consumer is well within your grasp. First thing’s first, before you can even start the design process, you need to determine whom you’re aiming your business at. That means defining your target audience. If you sell women’s clothing, it’s not enough to decide that “therefore the target audience is simply women.” No, you need to have more of an idea when it comes to their age, their geographical location, what they do for a living, whether they like to shop during weekends, and how much disposable cash they have to spend on clothing. How do you find out these key insights? Send out surveys. Conduct small focus groups. Talk to people on the street. Once you have all the relevant information, you can form what’s called a customer profile, which is the target consumer whom you need to keep in mind with everything that you do — and that includes the logo design process. This information will help you with every decision along the way, especially with the messages you’re trying to convey and your choices when it comes to color, font, layout, and other visuals. Every new business uses its logo to make the right impression with their target consumer. How? Well, they ensure that the design reflects their values. You can communicate any type of message you like through visuals — that’s the beauty of graphic design. You must always consider the interests and expectations of your target consumer. For instance, you wouldn’t design a serious, upmarket logo in a classic color like black or navy blue if you were trying to market accessible clothing to parents of young children. Instead, you might opt for a fun and bright-hued logo. 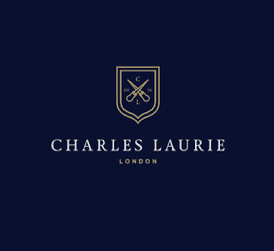 Traditional tailoring boutique Charles Laurie has a logo that uses blocky serif fonts, a distinctive monogram, and classic hues such as navy blue, gold, and white. This instantly communicates the look and feel of their product offering. It establishes them as a luxury brand and suggests that their target audience comprises middle-aged professionals. 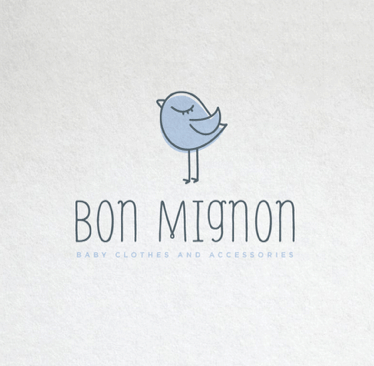 Similarly, contemporary boutique Bon Mignon offers trendy children’s clothing, which is implied through their cutesy logo in pastel hues. It also has a hand-drawn look that’s often associated with children and immediately creates a safe and friendly impression. Essentially, when designing the concept of your logo, you need to carefully consider the feelings and associations you want to promote. In terms of the actual design elements, these usually consist of the font denoting your brand’s name, an icon, and perhaps some sort of tagline. However, whichever icon you choose, it’s absolutely crucial that your logo sets you apart from other clothing boutiques. When it comes to your chosen font, this can be just as important as the icon, as it determines the legibility and memorability of your text. For more font do’s and dont’s, check out this article. 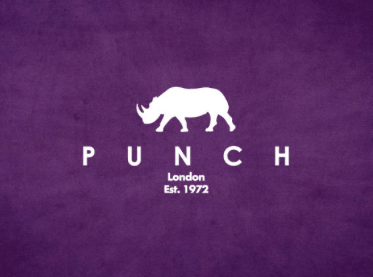 Punch London also tried to create the feel of a luxury brand that sells classic men’s, women’s, and children’s clothing. (Think: Ralph Lauren Polo.) However, the rhino icon, coupled with the vibrant purple coloring and simple typeface, generates the impression that they’re a modern, trend-driven clothing boutique. This just proves the significance of creating the right visual perception. It’s fine to go for a logo that’s considered a little “out there” and unusual; just make sure that the design elements always reflect your core values and product offering. Just as an appropriate icon can enhance the effect of your logo, so can the correct color scheme. Why? Well, have you ever heard of color psychology? Color has the power to control mood and evoke emotion, which is why you need to choose the right hues for your brand’s logo. Rule 101 of logo design: Stay away from any color that doesn’t particularly suit your brand. 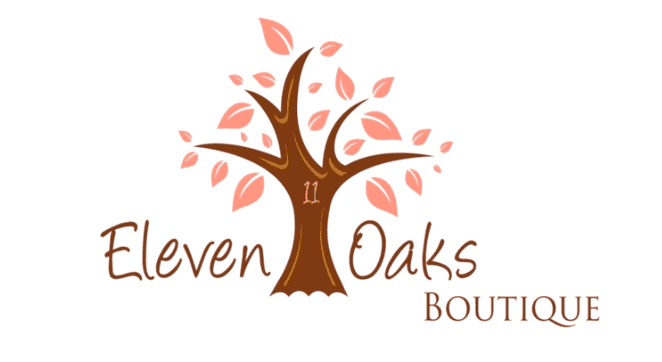 For instance, Eleven Oaks Boutique sells trend-driven womenswear, but you wouldn’t think this based on its dull brown logo that looks better suited to a natural foods company. Likewise, Lailahjo Boutique offers men’s, women’s, and kids clothing. However, the pink and purple color combination in their logo gives the impression of purely a female-oriented brand. In essence, make sure you pick out hues that capture the attention of your consumer, but also fit in with the attributes of your business. Sometimes, simplistic logos with the most basic layout are the most powerful. If you over-complicate your visual identity, you’ll start to confuse your consumer. For instance, there’s a lot going on with the logo of independent fashion boutique Nelly McCabe, from the borders to the four different hues, the icon, and the multiple words used. It’s difficult for a consumer to know where to look first. In addition, the icon is a bee, which is the emblem of the city of Manchester, England. However, the boutique is based in Glasgow, Scotland. When it comes to your logo’s layout, the trick is to arrange each design element in a way that attracts your consumer without over-cluttering the space. You can achieve this by playing around with your layout, the position of each design element, and the distance between them. Are you finding the logo design process way too challenging? That’s OK — you can get help! 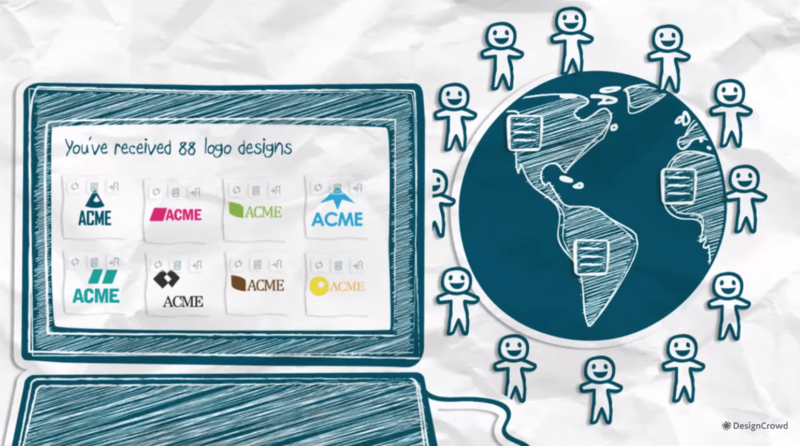 Start with the best logo design software. Tailor Brands, for example, is an amazing platform. Their logo makers use AI to generate a variety of options according to your brand’s personal style. All you need to do is sign up, indicate your design preferences, and then you’ll be sent designs that perfectly align with your branding strategy. Even though the website can be a little challenging for first-timers to navigate and the service is kind of pricey, Tailor Brands ensures high-quality work with a fast turnaround. To learn more about Tailor Brands, check out our expert review . Another option is to hire a graphic designer; however, it might take more time (and money) to find someone whom you really click with professionally. The other drawback is that your project is limited to the skills and time restrictions of one worker. If you go through a crowdsourcing service, like DesignCrowd, then all the hard work is done for you. All you do is sign up, make a brief, and set your deadline and budget. Then you can expect to receive over 50 designs by multiple designers within a certain timeframe. And if you want revisions, you can always work that out with your chosen designer. Read our expert review of DesignCrowd if you want to learn more about the platform. The downside to crowdsourcing agencies is that success isn’t always guaranteed. There could be hundreds of logo designs for you to pick from; however, you might find that you don’t like a single one of them. Poor communication and language barriers can often be to blame, but you’re entitled to a full refund if you deem it necessary. Click here to compare and contrast design contents, agencies, and freelancers. Either way, don’t be afraid to try out services that specialize in graphic design. Sometimes, we all need a little help, and it’s worth reaching out to obtain a professional-looking logo. When building your brand, your logo should be one of your top priorities. It’s the first thing your customer sees; therefore, it can immediately attract them to your brand — or put them off. Have fun with the visual identity of your fashion boutique and play around with concepts that reflect your core values. But above all, try to set yourself apart from the competition. It’s the only way that you’re going to survive in the overly saturated clothing market.